If you are new to Instructional Design, or eLearning, or EdTech or whatever we call ourselves these days, then maybe this won't seem like much of a find. But I've consumed my share of business, education, instructional design, pop-psychology, and management books, and it's always nice to find a NON-academic book that touches on learning and/or training. I've seen athletes and other professionals talk about how they "train", and then the natural follow up in our industry is to apply that knowledge to the world of corporate training. I know, because I've done it. It's a fun little exercise and would recommend you try it...and get over it. 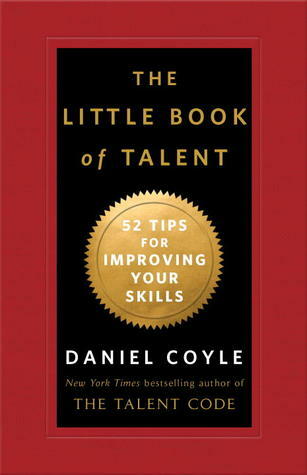 The Little Book of Talent is different in it's simplicity and how it effortlessly applies the phylosophies of skill improvement to both hard and soft skills, and in both business and non-business settings. The short bits of information are applicable and practical, but not prescriptive. The author is well aware that not all 52 tips are perfect for every situation. After only one reading so far, I already have favorites. Tip #33 rings true: "To learn from a book: close the book." The more important nugget in this tip however is expanding on the idea of "deep practice", "...one of deep practice's most fundamental rules: Learning is reaching." Think about that for a while. I like the last part, "Learning is reaching." I believe that learning is a continuous process and should never be taken for granted. This is also the reason why e-learning has become a global phenomenon since Internet was born.